Rian Por Than Khiow Wat Rong Bon, NaKornSreeTamMaRaht province was created in BE2513. This batch of amulets was created by Ah Jahn Chum Wat Hong Keow, and a total of 5000 pieces made of Neua Torng Daeng GaLaai Torng (Copper coated with Gold alloy). 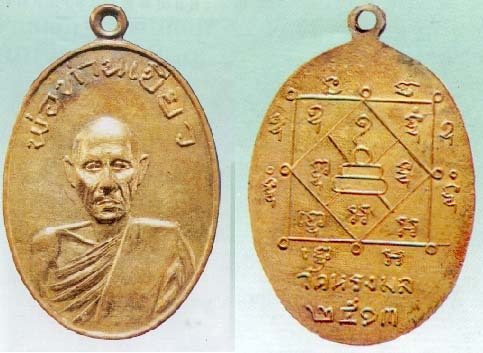 The front of the amulet is a half-sized portrait of Por Than Khiow, and the top part of the amulet is written "Por Tahn Khiow" The back of the amulet is a magical Yan, consists of outer square shaped Yan, a inner smaller diamond shaped Yan and right at the centre; a Yan shaped like a Buddha. This Yan is called "Yan Maha Ut" , a very popular Yan used for protection. The bottom of the amulet is written Wat Rong Mon instead of Wat Rong Bon and the year created BE2513. Rian Por Tahn Khiow first batch is very popular and the price costs more than 10,000 bahts. The surface of this Rian must look natural and not rough, and the Galaai Torng must resemble old Galaai used more than 30 years ago, this is because the original block used for moulding was stolen and many fake amulet were created using the stolen block. There is no difference in the markings between the real and the fake amulets, except that the fake ones are not chanted. However, there is a difference in the surface of the amulets, the surface of the fake amulet would be rough due to rust residues from the stolen block. There are also fakes which has exceptionally smooth surface, but these fakes could be differentiated from the fairly new coat of Galaai applied on them. A beautiful and good condition of Rian Por Tahn Khiow, can easily cost between 30,000 to 40,000 bahts. This amulet is famous for it's protective power and invulnerability to weapons and danger.